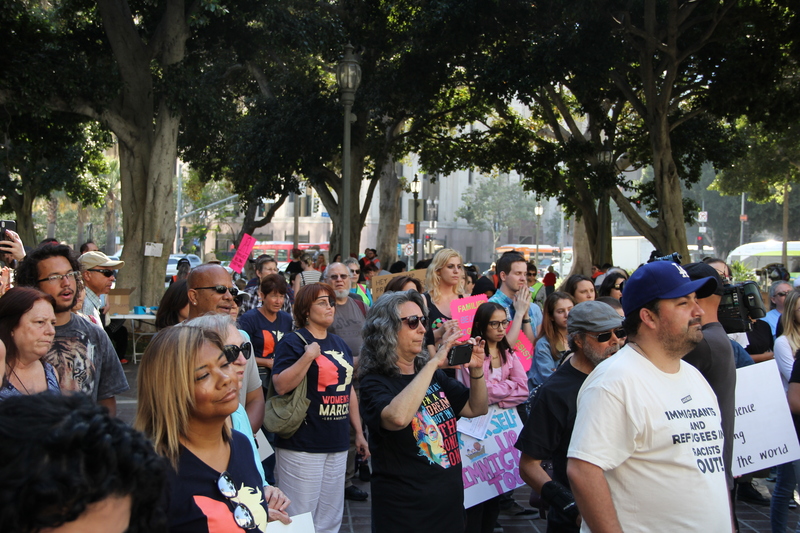 Brown and orange donation boxes crowded the open space in front of the Los Angeles City Hall Thursday evening as protesters congregated for the Women’s March Los Angeles Rally for Families Belong Together. Protestors rallied against the “Zero-Tolerance” policy enacted by the Trump Administration, which separates illegal immigrant families at the United States Border. It has gained critical attention as countless high-level politicians, like Rep. John Lewis, D-Ga., and Senator Elizabeth Warren, D-Ma., have publicly condemned current border practices, calling for a change in border legislation. “I am here today to advocate for the children who do not have a voice amongst this issue as an effort to make the whole issue more vocal,” Kimberly Mednietta said, a recent graduate of iLead North Hollywood Charter School. Protesters gathered with signs that read everything from, “STOP ICE” to “Families have no borders.” Women’s March Los Angeles also handed out markers and poster paper for protesters to make signs at the rally. The event was not solely created for citizens to rally, but it was also to donation center. Volunteers helped label and separate boxes into various categories. Demonstrators were able to donate supplies, clothing, hygiene products and toys for families and children separated at the border. The items will be shipped on June 29 to Texas. “This is blatantly a violation of human rights,” said Aerex Narvasa, also a recent graduate of iLead North Hollywood Charter School. Some individuals went beyond signs and chants and donned a more vocal demonstration. In a black suit with an excessively long red tie, one protester who goes by the name of “Ronald Rump” dressed up as a parody of Donald Trump. With a rubber Donald Trump mask and a Dr. Ronald Rump name badge, his costume attracted many spectators, despite remaining quiet. Throughout the event, various speakers, including a reverend from the Martin Luther King Jr. Foundation, encouraged protestors to demand change. A march was also held on Saturday, June 30 to continue efforts in making the government reform border legislation. Do you guys have any recordings of the speeches given?